You are invited to an information session on a new investment and project financing mechanism that was included in the federal tax reform act passed at the end of 2017. Opportunity Zones create opportunities for investors with capital gains to defer and lower the taxes on their gains and realize potential tax free profits by investing in funds created to invest in business opportunities within designated “opportunity zones” that have been established nation-wide. When: Thursday, December 6 at 5:00 p.m.
Where: Community Room of the Lakeshore Center, 600 E. Lakeshore Drive, Houghton, Michigan. Please RSVP to Tara at info@keweenaw.org by November 30, 2018. Also, please share this invite with anyone you think would be interested. We will have a state level expert to help us better understand the Opportunity Zone program, how investors can participate, types of investments that Opportunity Zone Funds can make, and discuss the questions and comments that need to be submitted to the IRS regarding the current set of proposed rules that govern investments. 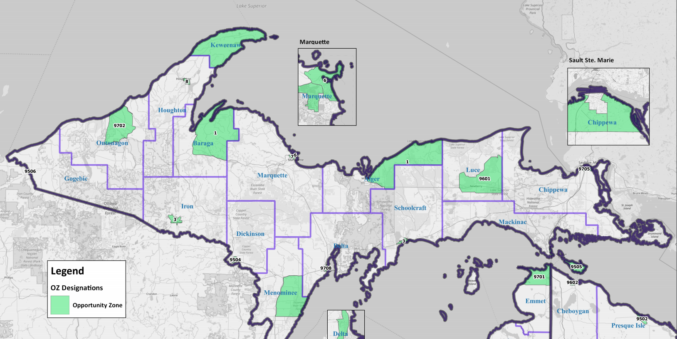 We will also spend a brief amount of time collecting potential investment opportunities in order to ensure that both local and out of area investors are aware of the potential investment opportunities available in the Keweenaw. Opportunity Zones are designed to incentivize investment into areas of the United States that are deemed as lagging economically based on census tract income levels. Please take this opportunity to learn how you can help the Keweenaw prosper. Copies of the law creating the program, proposed IRS rules and other information related to the Opportunity Zones are found here.